The eight-time champion will face Gael Monfils or Kevin Anderson in the next round. Standing ovation: Federer eased through on Monday afternoon. 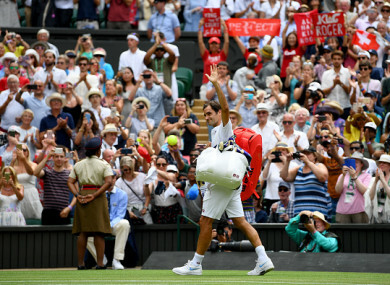 ROGER FEDERER NEEDED just 16 minutes to win the opening set in a 6-0, 7-5, 6-4 defeat of France’s Adrian Mannarino to reach his 16th Wimbledon quarter-final on Monday. Eight-time champion Federer will be playing in his 53rd Grand Slam last-eight when he tackles either Gael Monfils of France or Kevin Anderson, the eighth-seeded South African. Top seed Federer, 36, has now won 32 consecutive sets at Wimbledon, just two behind his record set from the third round in 2005 to his title triumph in 2006. “It was crucial for him to stay in the match at the beginning of the second set and then it got tougher,” said Federer after his sixth win in six meetings against French left-hander Mannarino. Federer boasts a 4-0 career record against 2017 US Open runner-up Anderson and 9-4 over Monfils. Monfils and Anderson have yet to get to the quarter-finals at Wimbledon, although the French shotmaker may just be the slight favourite as he has a 5-0 winning record over the big South African. Later Monday, two-time champion Rafael Nadal attempts to make the quarter-finals for the first time since he finished runner-up in 2011. The world number one faces Czech world number 93 Jiri Vesely, who has never got past the fourth round of a Grand Slam. Victory for Nadal over his fellow left-hander would take him into a 35th Grand Slam quarter-final. It would also give him a last-eight clash against Juan Martin del Potro, the fifth seeded Argentine, or unseeded Gilles Simon of France. Three-time champion Novak Djokovic, seeded a lowly 12 this year, can make his 10th Wimbledon quarter-final if he defeats unseeded Karen Khachanov, the world number 40 from Russia. The winner of that clash will take on either Japan’s 24th seed Kei Nishikori or unseeded Ernests Gulbis. World number 130 Gulbis came through qualifying and shocked fourth seeded German Alexander Zverev in the third round. Gulbis has played three successive five-set matches to get this far and is bidding to become just the sixth qualifier to reach the last-eight at Wimbledon. Should number 103 Mackenzie McDonald defeat former runner-up Milos Raonic later Monday, it will be the first time since 2000 that two men outside the top 100 have made the Wimbledon quarter-finals. Stefanos Tsitsipas can make history by becoming the first Greek player — man or woman — to reach a Grand Slam quarter-final if he beats US ninth seed John Isner. The 19-year-old 31st seed has already put in his best performance at a Slam and is bidding to prevent Isner, 14 year his senior, making the quarter-finals for the first time. Email “Federer needs just 16 minutes to win first set en route to Wimbledon quarters ”. Feedback on “Federer needs just 16 minutes to win first set en route to Wimbledon quarters ”.